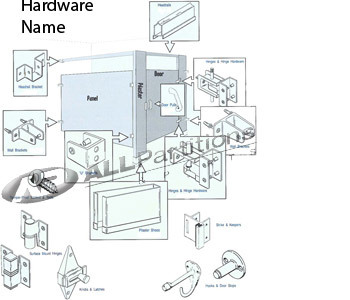 • Supplied with mounting screws. Bright Chrome. For 1-1/4" thick round edge pilasters. 1-1/2" between screws. Face of hinge to end of arm = 1-5/8". Brushed/satin stainless steel. For 1-1/4" thick round edge pilasters. 1-1/2" between screws. Face of hinge to end of arm = 1-5/8". Brushed satin stainless steel. For 1-1/4" thick round edge pilasters. 1-1/2" between screws. Face of hinge to end of arm = 1-5/8". (Metal), 3/8" diameter, 3" long. Goes with 5/8" pintle part #G0237. Part number G0220 is unplated/unpainted metal. Part number G0220BC is bright chrome. Part number G0240 is unplated/unpainted metal. Part number G0240BC is bright chrome. For standard stalls: Non-ADA latch cover and knob, snap together. And held together with screw. ADA Knob and cover, snap together. ADA Knob and cover w/screw. Chrome plated zamak. For 1 1/4" thick round edge pilaster. Typically used on metal partitions with round concealed latch slide pin. Brushed/satin stainless steel. For 1-1/4" round edge pilasters. 5/8" bar to door clearance. Chrome plated zamak. Surface latch with 3-1/2" between screws and 3/8" offset. Used when door and pilaster are the same thickness. For outswing doors. Bright chrome. For 1-1/4" round edge pilasters. For inswing doors. Bright chrome. For 1-1/4" round edge pilasters. click here to order parts from Mills, which will work. Replaces G631K. Includes mounting screws. x 3 1/4" long. 2 3/4" hole spacing. 1-1/2" between screws. For 1-1/4" square edge pilasters.